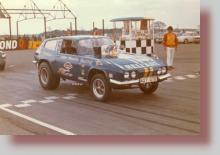 and was a pivotal figure in UK drag racing for many years. The Acceleration Archive for us all to enjoy. Before his involvement with John Woolfe Racing, David Riswick served in the US Air Force based at RAF Upper Heyford. 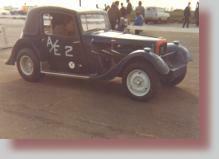 He soon joined a Northampton based drag racing team and was driving this 1930s BSA Scout. 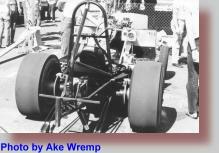 The car was built by Mark Stratton in 1965/66 and had a 265 cubic inch engine. The team called it 'Hustler'. Mark Stratton is seen driving the car here, his strange posture is due to the fact that he was trying to re-light his roll-up cigarette! For any aircraft buffs out there, the plane is an F101 Voodoo known as the 'lead sled' because it was quite a heavy plane. And here is the team, from left to right Mark Stratton, David Riswick and Ken 'Tex' Blake. This picture was taken in 1967 on the flight line at RAF Upper Heyford by which time Mark had shoe-horned a 4.7 litre Chevy into the car. Dave had spent most of the year ordering speed equipment by mail order from the States. As a result the team won the Super Eliminator Trophy in August at the 2nd Annual Championship at Santa Pod. The winning ET was 12.4 seconds at 112 mph. The eagle eyed amongst you will spot the firing order written on the bulkhead. In September John Woolfe, a semi-professional circuit racer, having heard about drag racing, decided to enter his mighty 7 litre Ford powered AC Cobra. Despite running a faster time he was somewhat bewildered to have lost to the "rather unusual looking" Hustler driven by 'Tex' Blake particularly when he found out it only had a 4.7 litre engine. As the picture clearly shows - 'He who snoozes loses'. Chief Starter Brian Holmes is standing in the centre of the track with (possibly) Ian Denman to his right. John Woolfe decided to sponsor the team to the tune of a brand new 7 litre Chevrolet engine, in Dave's words "We were all like dogs with five tails". An L-88 race ready 435 bhp 'rat motor' was duly delivered and installed in the Hustler over the winter of 1967/68. The car also gained a blue and yellow paint job and the familiar wolf head logo. Most importantly, it ran 10.9 at 131 straight off the trailer which was an historic advancement in those early days. Mark Stratton was the driver in 1968. And just to prove it was blue and yellow - here is a colour picture of the beast. Needless to say, with such an advance in performance the car took the Super Eliminator Trophy at the August Nationals meeting for the second year in a row. In the meantime, John Woolfe had acquired a garage site at Eaton Socon on the A1 to use as his headquarters and, as he needed someone to run the operation, he suggested that Dave should enter into partnership with him. It was agreed that when Dave's commitment to Uncle Sam came to an end he would return to the UK and join the new venture. This, and the next two pictures, were taken at Silverstone on the occasion of a photo shoot for 'Motor' magazine. The chap bending over the car was an RAC steward. Meanwhile, at Mark Stratton's place, plans were afoot to create another over the top project. This involved coupling the 4.7 litre lump newly liberated from the Hustler with another similar unit sitting in Dave's '57 Chevy that he had left in storage. 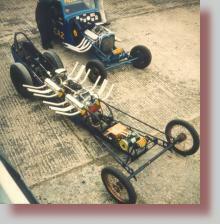 The result was one of the first twin engined dragsters outside of the USA - Hustler II. The engines were timed together to form a 9.4 litre V-16, this dramatic picture of the car seems to emphasise the unity of the engines. 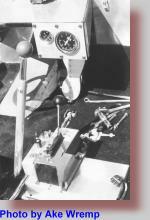 John Woolfe had realised that Hustler II was a candidate for the world record weekend to be held in early October 1968 and promptly applied to the RAC for an entry. 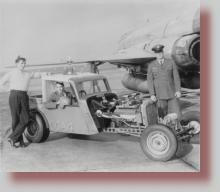 John was subsequently strapped into the car at RAF Elvington near York and proceeded to establish the outright world record for the standing start quarter mile for cars with an engine capacity in excess of 8 litres. The record was set at 12 seconds with an average speed of 73 mph and it stood for almost 20 years. John Woolfe was over the moon with the results. Here is John Woolfe preparing to make one of his runs in Hustler II. Mark Stratton is standing behind the car and is being waved away by the stewards who did not permit any sort of interference or assistance near the start line. The transporter was a Fiat with a Bartoletti body originally built for the US Scarab Grand Prix team, then used by Team Lotus and Alan Mann Racing before passing to John Woolfe. 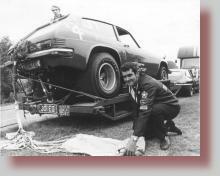 Whilst at this event another pivotal character in the history of John Woolfe Racing came on the scene - Dennis Priddle. Dennis had been trying to take the under 8 litre record in the methanol-burning Chrysler V8 dragster Tudor Rose. Tudor Rose was wholly owned by Rex Sluggett and had been hand built by Rex and Dennis. Hustler was retired over the winter of 1968/69 in favour of an all-new car. Mark Stratton was friendly with one of the marketing people at the Reliant Motor Company and managed to persuade him to donate a fibreglass body from the new version of the Reliant Scimitar known as the GTE (the 'E' stood for estate). Dennis Priddle is driving the car here which has been fitted with a deflector to reduce the amount of air entering the carbs. For those of you who think the 'barn' has been at Santa Pod for ever - here it is in the process of construction in 1969. Nothing like this had been built before and with John's help and encouragement the car became the state of the art in the sport. 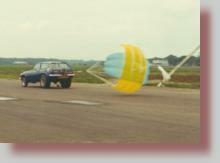 With great celebration the team named it 'Whistler' and the Reliant GTE made its first runs at Santa Pod in the spring of 1969. Dave and Dennis were invited to race Whistler in Sweden for their Second Annual Drag Fest and the car was a big hit when Dennis drove it to victory in front of 15,000 Scandinavian spectators. These pictures of Whistler were taken at Anderstorp in Sweden. 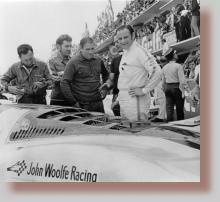 In 1969 John Woolfe tragically lost his life during the Le Mans 24 hour race whilst driving a Porsche 917 fitted with a factory prepared engine. He had qualified the car in 21st place, but by virtue of the running start had managed to grab 17th spot before the first turn. John crashed into a barrier wall at high speed just past Whitehouse bend and was thrown from the car. He died instantly. John's half of the partnership passed to Arnold Burton who agreed that Whistler could continue to be campaigned for the remainder of the season. 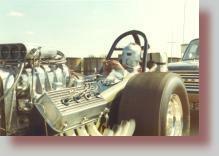 Dennis Priddle was recruited to drive the car and in his hands it was unbeatable when running 10.4 second runs at 140mph. Consequently the Stratton stable won the Super Eliminator Trophy at Santa Pod for the third year in a row. At the presentation that followed, there was a minute's silence in memory of John Woolfe. While Dave and Dennis were in Sweden, they were made very much aware of the Swedish invasion of the British drag racing scene that was about to happen and this sparked off thoughts of running a top fuel car for the 1970 season. From top to bottom Dave, Whistler and Dennis. 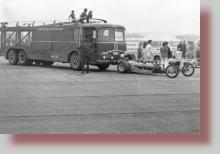 This picture was taken at JWR's Eaton Socon garage, check out the E-Type Jaguar tow car. All of the above cars (except John Woolfe's cars) were built in Mark Stratton's workshop. 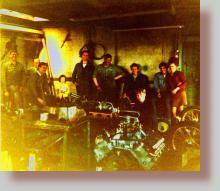 This is a rather poorly exposed picture of the workshop at Pattishall (Fosters Booth) on the A5 near Weedon In Northamptonshire taken circa December 1967. This shows the new 427 L-88 engine for Hustler in the foreground with the twin engined car under construction behind. The crew is from left to right : Ken 'Tex' Blake (Upper Heyford base), Mr Stratton (Mark's Dad), Mark Stratton, Lyddia Stratton (Mark's daughter), Brian Matchett (crew), Bill Correia (Upper Heyford base), Colin Saunders (drove Hustler II at Pod), Norman Simmonds (crew), Barbara (Norman's girlfriend), and Tony Stratton, sitting (Mark's son). 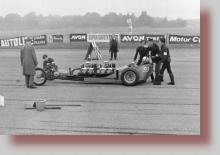 A plan was hatched to construct a top fuel dragster and two other guys from Yeovil in Somerset, Tony Gane and Ray Prichard, were recruited into the team. The idea was that Dennis, Tony and Ray would come up with the rolling chassis and Dave would supply "the expensive bits". When Dave and Dennis had been in Sweden, they had been approached by an American named Pete Millar who had a supercharged roadster to sell called 'Crescent Coupe'. 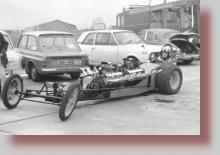 This car was subsequently purchased and the engine and various other components were used to create the Quartermaster top fuel dragster. 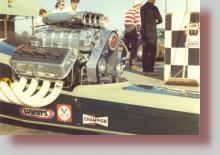 Quartermaster's power plant was the 354 inch Chrysler taken from Pete Millar's Crescent Coupe. The engine had been built by Sid Waterman in California. If you look very carefully you can see damage to the paintwork below the front of the engine caused by leaking nitro. 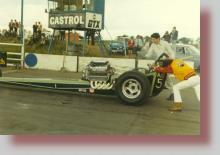 Quartermaster is pictured here at Santa Pod getting the final once over from Tony Gane prior to a run. 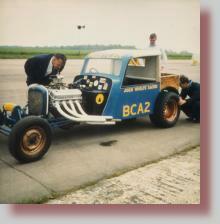 The car made its debut at the National Drag Racing Club's first major event at Blackbushe Aerodrome. 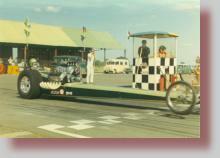 This was the first drag race staged at Blackbushe since the 1965 Dragfest. Unfortunately the fuel pump drive broke on the line and the car was sidelined. Tony Gane and start line marshal Stu Bradbury are pushing the car into stage. 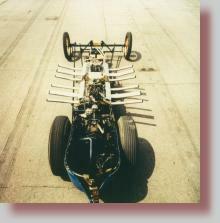 Tony Gane had built and ran the mini-dragster 'The Rudge' which won the top dragster title at the first National Championship at Santa Pod in 1966. 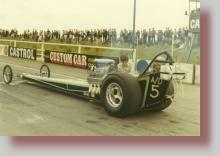 A great leaving shot as Dennis Priddle blasts Quartermaster off the line at Santa Pod. The car managed a best of 8.4 seconds at 193 mph before being destroyed in an accident in the shut-off area. Pictures of the damage that the car sustained will follow on a future page. Fortunately Dennis, although shaken up, was not hurt in this incident. This is a picture of the Corgi model of Quartermaster that Mettoy made in 1970 and which has now become a collector's item.